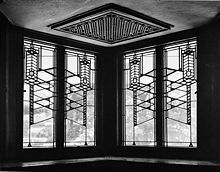 Window was designed by architect, Frank Lloyd Wright for the Robie House. Interior Architecture is the design of a building or shelter inside out, type home that can be fixed. It can also be the initial design and plan for use, then later redesign to accommodate a changed purpose, or a significantly revised design for adaptive reuse of the building shell. The latter is often part of sustainable architecture practices, conserving resources through "recycling" a structure by adaptive redesign. Generally referred to as the spatial art of environmental design, form and practice, interior architecture is the process through which the interiors of buildings are designed, concerned with all aspects of the human uses of structural spaces. Put simply, Interior Architecture is the design of an interior in architectural terms. The art and science of designing and erecting building and their interiors as a licensed architect and related physical features. 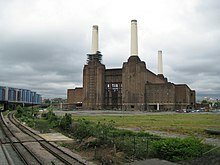 The Battersea Power Station of England has become an iconic structure through adaptive reuse and has been featured in many forms of culture during its more-than-seventy-year-long history. One of the most successful residential reuse projects was Gasometer City, in Vienna Austria. Four immense disused gasometers were successfully revamped in the late ‘90s and have since become famous in the world of adaptive reuse. This unique redevelopment has since become a sought after place to live with a close-knit inner community, and is looked upon as a very successful example of adaptive reuse. The World Food Prize Hall of Laureates, formerly the Des Moines Public Library on the western bank of the Des Moines River in downtown Des Moines, Iowa. Although the original spatial hierarchy of a building is always established by its first architect, subsequent iterations of the interior may not be, and for obvious reasons, older structures are often modified by designers of a different generation according to society’s changing needs as our cities evolve. This process often re-semanticizes the building as a consequence, and is predicated on the notion that buildings can never really be complete and unalterable. Cities are now dense with such buildings, perhaps originally built as banks that are now restaurants, perhaps industrial mills that are now loft apartments, or even railway stations that have become art galleries. In each case the collective memory of the shape and character of the city is generally held to be more desirable than the possibility of a new building on the same site, although clearly economic forces apply. It is also possible to speculate that there might well be further new interiors for these structures in future years, but for each alteration the technical and technological expertise of the era will determine the extent to which the building is modified in its building life cycle. Certain structure's interiors remain unaltered over time due to historic preservation, unchanged use, or financial limitations. Nevertheless, most buildings have only three possible long-range internal futures: First, designated significantly important to maintain visually unchanged, only accommodating unseen modern utilities, access, and structural stabilization, and restoration needs. Second, demolished to make way for a new building on the same site, or abandoned, becoming ruins. Finally, redesigned and altered to accommodate new uses. There are many different degrees of alteration – a minor one to enable the building to conform to new legal codes is likely to prolong the first (or indeed later) iteration of interior space, but a major alteration, such as the retention of only the facade, is to all intents and purposes a new building. All possibilities within and between the two extremes are the domain of the interior architect. If the practice of Architecture is concerned with the art and science of new building, then the practice of Interior Architecture is concerned with the alteration of existing buildings for new uses. A critical part in the evolution of interior architecture and design is sustainability and consciously thinking of the environment and the materials being sourced- energy use, site selection, water usage, and material selection (Leigh Bacon). This sub-category of Interior Architecture focuses on finding creative and holistic ways of building new or retro fitting existing structures that have little to no impact on the environment. The eco-friendly movement became an important issue around the 1970s when the major energy crisis struck, making individuals aware of their contributions and what can be done to help lighten the impacts (BStone). Sustainability in Interior Architecture has really taken off in the last few decades with the help and advancements of technology, discovering new materials and efficient concepts that still lend the aesthetically pleasing aspect of a design. In past years, when it came to eco-design it had a stale and lack of luxury, elegance, and overall design; which inevitably received the reputation of being a "hippies" style or way of living. This is far from the case today with the overall known importance of being environmentally responsible, having an abundant amount of material options, and wanting to withhold an aesthetic design. Sustainable design is now a preferred and desired way of thinking and building that has and will be an ever-expanding and growing field. Education in interior architecture should include the study of historic architectural and design styles, building codes and safety, preserving and restoring old buildings, drawing plans of original designs, and building physical and virtual (computer-based) models. The field of interior architecture has a lot in common with interior design and decorating; however, it typically focuses on architecture and construction. Students of both fields learn to design comfortable, safe, and useful indoor spaces, from downtown penthouses to high school classrooms. A student of interior architecture will learn about much more than artistic concerns, such as choosing which style of furnishings works well in an open, loft-like apartment. Study will also include information on technical issues, such as seismic retrofitting (making old buildings safe from earthquakes). Interior Architecture stands at the intersection of architecture, design of the built environment, and conservation. Interior architecture programs address the design issues intrinsic to the re-use and transformation of existing structures through both an innovative and progressive approach. The National Center for Education Statistics states that the definition of a degree program in interior architecture is: "A program that prepares individuals to apply architectural principles in the design of structural interiors for living, recreational, and business purposes and to function as professional interior architects. Study includes instruction in architecture, occupational and safety standards, structural systems design, heating and cooling systems design, interior design, specific end-use applications, and professional responsibilities and standards." In addition to earning a degree in interior architecture, general licensure is required to work within the United States and some states have further licensing requirements. In many European countries and in Australia the use of the title "Interior Architect" is legally regulated. This means that a practicing professional cannot use the title of "Interior Architect" unless they complete the requirements for becoming a registered or licensed architect as well as completing a degree program. Auburn University, School of Architecture, Planning and Landscape architecture. Interior Architecture Program. ^ "Frank Lloyd Wright: His Life and His Architecture," Twombly, Robert C., John Wiley and Sons, Inc., 1979, p. 384. ^ a b "Interior Architecture". RISD Interior Architecture Graduate Department. ^ "The Nova Scotia Legislature". gov.ns.ca. Archived from the original on 2011-07-21. ^ a b "7 Excellent Examples of Adaptive Reuse - Archi-Ninja". archi-ninja.com. ^ Bacon, Leigh (May 1, 2011). "Interior Designer's Attitudes Toward Sustainable Interior Design Practices and Barriers Encountered when Using Sustainable Interior Design Practices". Digitalcommons@UniversityofNebraska. Retrieved March 10, 2016. ^ "The History of Green Building & Construction: The Beginning of Green Homes". Bright Hub. Retrieved 2016-03-10. ^ "Bureau of Labor Statistics Occupational Outlook Handbook 2010-2011". Archived from the original on 30 March 2010. ^ "Become an Interior Architect: Step-by-Step Career Guide". Study.com. ^ "Interior Architecture and Design - The George Washington University". gwu.edu. 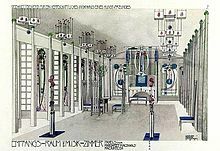 ^ "School of Interior Architecture". the-bac.edu. ^ "Architecture/ Interior Architecture". German Jordanian University. ^ "College of Architecture at the University of Houston - University of Houston". uh.edu. 17 February 2015. ^ "Institute of Technology Sligo". IT Sligo. ^ "School of Architecture". unlv.edu. ^ "SAIC: Architecture Programs, Interior Architecture, & Designed Objects - School of the Art Institute of Chicago". saic.edu. ^ "Interior Architecture Department". cornish.edu. ^ "CADC Student Services - Auburn University". auburn.edu. ^ "About - Interior Architecture - Built Environment - UNSW Australia". unsw.edu.au. ^ "Faculty of Architecture – Faculteit Architectuur KU Leuven". wenk.be.